John Deere now offers three new 9RX Narrow Track Tractors, an ideal fit for 22-, 30- and 40-inch row-crop applications. John Deere introduces three new 9RX Narrow Track Tractors, expanding its lineup of high-horsepower machines. Equipped with a narrow undercarriage, these four-track tractors are an ideal fit for 22-, 30- and 40-inch row-crop applications. Three models are available with 420, 470 or 520 horsepower to easily handle high-speed planters, nutrient application bars, large grain carts or other high-horsepower needs. With this introduction, the John Deere 9 Family of Tractors now includes wheeled, 2- and 4-tracks and narrow- or wide-undercarriage configurations. “No other tractor manufacturer offers customers so many choices in high-horsepower tractors, and they’re each backed by the best dealer network in the industry,” says Tiffany Turner, product marketing manager for John Deere. All 9RX Narrow Track Tractors provide row-crop farmers the ability to cover more acres per day with improved row-crop capabilities, more horsepower featuring the latest advances in engine technology and enhanced flotation along with plenty of ground-gripping traction. The narrow-undercarriage tractor can be fitted with available 18- or 24-in wide tracks and set to a track spacing of 80, 88 or 120 inches. 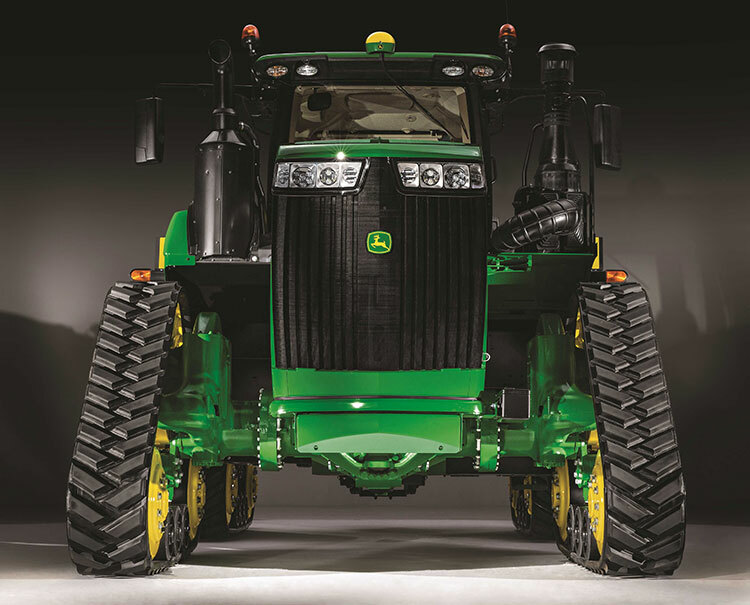 John Deere has added three new narrow track versions to its 9RX Tractor lineup. The three models are available with 420, 470 or 520 horsepower and are available with 18- or 24-in wide tracks. John Deere is currently taking orders for 9RX Narrow Track Tractors and will begin production in January, 2018. For more information, contact your local John Deere dealer or visit JohnDeere.com/ag.